Our research is centered on developing efficient and abundant metal catalysts for the production of fuels or feedstock chemicals using renewable energy. Our approach takes inspiration from enzymatic active sites as well as thermochemical activity descriptors used in heterogeneous catalysis. The initial targets are the electrocatalytic reduction of water to hydrogen, and carbon dioxide to more energy-dense carbon fuels. The research combines synthesis with advanced electrochemical and spectroscopic techniques. Detailed mechanistic and kinetic studies are employed to improve catalyst design and optimize activity. Transition metal hydrides (shown in red to the left) are critical intermediates in hydrogen production (path A) and carbon dioxide reduction to formate (path B). In order to improve our understanding of electrochemical hydride generation and reactivity, we are forming predictive models of hydricity in aqueous solvents. We are also investigating if hydricity is an appropriate activity descriptor for catalytic activity. Additionally, quantifying the hydricity will facilitate the design of catalysts with tailored product selectivity. To date, we have developed a new complex for electrocatalytic aqueous hydrogen production and an abundant transition metal hydride complex that can perform hydride transfer to carbon dioxide. "Directing the reactivity of metal hydrides for selective CO2 reduction" (pdf) Ceballos, B. M.; Yang, J. Y. * Proc. Natl. Acad. Sci., 2018, 115(50), 12686 - 12691. "pH-Dependent Reactivity of a Water-Soluble Nickel Complex: Hydrogen Evolution vs Selective Electrochemical Hydride Generation" (pdf). ​Tsay, C.; Ceballos, B. M.; Yang, J. Y. * Organometallics, 2019, 38(6), 1286-1291. "CO2 Reduction or HCO2- Oxidation? Solvent Dependent Thermochemistry of a Nickel Hydride Complex" (pdf)​. Ceballos, Bianca M.; Tsay, C.; Yang, J. Y. * Chem. Commun. 2017, 53, 7405-7408. "Electrocatalytic Hydrogen Evolution under Acidic Aqueous Conditions and Mechanistic Studies of a Highly Stable Molecular Catalyst" (pdf). Tsay, C.; Yang J. Y. *, J. Am. Chem. Soc., 2016, 138(43), 14174-14177. ﻿﻿The active site of the Ch Ni-CODH II enzyme suggests carbon dioxide activation occurs through a cooperative interaction between a Lewis basic nickel and a Lewis acidic iron (shown on the left). We are developing synthetic mimics that position a Lewis acid proximate to a Lewis basic metal center in order to replicate this cooperative interaction. Our initial studies found proximal redox-inactive cations to redox active metals can significantly tune the redox potential of the latter. We have found evidence the shifts in redox potential are likely due to an electric field potential from the cation. We are also exploring unusual trends in redox reactivity and catalysis by proximal cations. ​"Cationic Charges Lead to Inverse Free Energy Relationship for N—N Bond Formation by Mn(VI) Nitrides" (pdf). Chantarojsiri, T.; Reath, A. H.; Yang, J. Y. * Angew. Chem. Int. Ed., 2018, 57, 14037-14042. "Incorporation of Redox-Inactive Cations Promotes Iron Catalyzed Aerobic C–H Oxidation at Mild Potentials" (pdf). Chantarojsiri, T.; Ziller, J. W.; Yang, J. Y. * Chem. Sci., 2018, 9, 2567 - 2574. "Redox Potential and Electronic Structure Effects of Proximal Nonredox Active Cations in Cobalt Schiff Base Complexes" (pdf). Reath, A. J.; Ziller, J. W.; Tsay, C.; Ryan, A. J.; Yang, J. Y. * Inorg. Chem. 2017, 56(6), ​3713-3718. "Reactivity of a Series of Isostructural Cobalt Pincer Complexes with CO2, CO, and H+" (pdf). Shaffer, D. W.; Johnson, S. I.; Rheingold, A.; Ziller, J.; Goddard III, W.; Nielsen, R. J.; Yang, J. Y. *, Inorg. Chem. 2014, 53(24), 13031-13041. "Intramolecular Hydrogen-Bonding in a Cobalt Aqua Complex and Electrochemical Water Oxidation Activity" (pdf). Kotyk, J. F. K.; Hanna,C. M.; Combs, R. L.^; Ziller, J. W.; Yang, J. Y. * Chem. Sci. 2018, 9, 2750 - 2755. 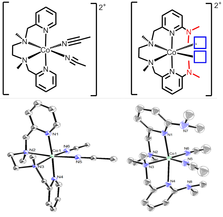 "Copper Tetradentate N2Py2 Complexes with Pendant Bases in the Secondary Coordination Sphere: Improved Ligand Synthesis and Protonation Studies" (pdf) Kotyk, J. F. K.; Ziller, J. W.; Yang, J. Y. *, J. Coord. Chem., 2016, 69(11-13), 1990-2002. "Incorporation of Hydrogen-Bonding Functionalities into the Second Coordination Sphere of Iron-Based Water-Oxidation Catalysts” (pdf). Hoffert, W. A.; Mock, M. T.; Appel, A. M.; Yang, J. Y. * Eur. J. Inorg. Chem. 2013, 22-23, 3846-3857. We have also developed a new tripodal tetradentate ligand incorporating a strong phosphine donor based on proazaphosphatrane, shown on the right. The Tolman parameter indicates it is among the most donating phosphines that has been measured. Additionally, the possibility of a transannular interaction in the proazaphosphatrane could increase the donor strength. We are currently investigating the trans effect of the strong phosphine donor on promoting unusual reactivity. "Adaptable Ligand Donor Strength: Tracking Transannular Bond Interactions in Tris(2-pyridylmethyl)-azaphosphatrane (TPAP)" (pdf). Zhammavongsy, Z.; Cunningham, D. W.; Sutthirat, N.^; Eisenhart, R. J.; Ziller, J. W.; Yang, J. Y. * Dalton Trans., 2018, 47, 14101-14110. "Electronic and Steric Tolman Parameters for Proazaphosphatranes, the Superbase Core of the Tri(pyridylmethyl)azaphosphatrane (TPAP) Ligand" (pdf). Thammavongsy, Z.; Kha, I. M.^; Ziller, J. W.; Yang, J. Y. *, Dalton Trans., 2016, 45, 9853-9859. "Flexibility is Key: Synthesis of a Tripyridylamine (TPA) Congener with a Phosphorus Apical Donor and Coordination to Cobalt(II)" (24.pdf). Thammavongsy, Z.; Kotyk, J. F. K.; Tsay, C.; Yang, J. Y. *, Inorg. Chem., 2015, 54(23), 11505-11510. Photoelectrochemical cells offer an integrated path towards direct chemical fuel generation from solar energy. However, most photoabsorbers are poor catalysts and require functional coupling with efficient molecular electrocatalysts. We are developing a milder method of catalyst attachment that is stable, synthetically accessible, and provides facile electron transfer. "Proton-Coupled Electron Transfer at Anthraquinone Modified Indium Tin Oxide Electrodes" (pdf) Hanna, C. M.; Luu, A.; Yang, J. Y. * ACS Appl. Energy Mat. 2019, 2(1), 59-65. "Interfacial Electron Transfer of Ferrocene Immobilized onto Indium Tin Oxide through Covalent and Noncovalent Interactions" (pdf). Hanna, C. M.; Sanborn, C. D.; Ardo, S.; Yang, J. Y. * ACS Appl. Mater. Interfaces, 2018, 10(15), 13211-13217. "Chemical Modification of Gold Electrodes via Non-Covalent Interactions" (pdf). Lydon, B. L.; Germann, A.^; Yang, J. Y. *, Inorg. Chem. Front., 2016, 3, 836-841. Professor Markus Ribbe and Professor Yilin Hu at UC Irvine recently reported catalytic reduction of CO2, CO, and CN- into methane and hydrocarbons by the nitrogenase enzymes and their isolated cofactors using chemical reductants. In collaboration with Prof. Ribbe and Prof. Hu, we are investigating the redox properties of the nitrogenase enzyme in order to perform catalysis using an electrochemical potential. We are currently working with the isolated cofactors, but will progress to working with the enzyme. Additionally, will are applying in situ spectroelectrochemical techniques to identify catalytic intermediates, as well as detailed kinetic studies on the catalytic rate. “Electrochemical Characterization of Isolated Nitrogenase Cofactors from Azotobacter vinelandii”. Lydon, B. R.; Lee, C. C.; Tanifuji, K.; Sickerman, N. S.; Newcomb, M. P.; Hu, Y. *; Ribbe, M. W.*; Yang, J. Y. *, in review. The Yang Group would like to acknowledge the following organizations for financial support. Thank you!